In the hands of steve.moody. Use TB1B04N to reference this item. 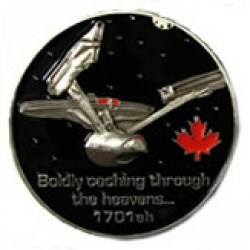 Took the Star Trek geocoin to move on to a new location. Will launch as soon as weather conditions permit. Countdown on hold. Nice coin with a lovely story behind it. I will move it on to somewhere peaceful soon. A lovely coin and a great journey to come! Discovered this impressive trackable at the Hampshire Monthly Midweek Cache Event #6. Thanks. Discovered your fine trackable while attending the Hampshire Monthly Midweek Cache Event #6. Thank you for sharing it!